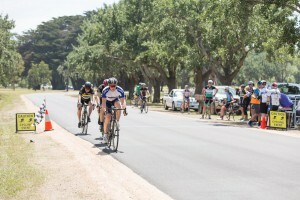 The inaugural EUREKA Cycling Criterium Championships were staged in Victoria Park under a blue sky and warm sun. 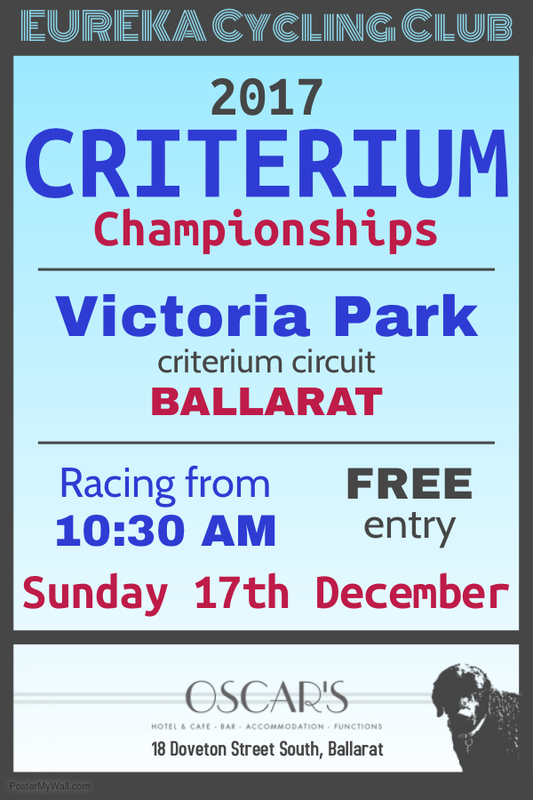 Proudly sponsored by OSCAR’S Hotel and Cafe, the Criterium Championships promised to be an exciting conclusion to the 2017 Eureka racing season. 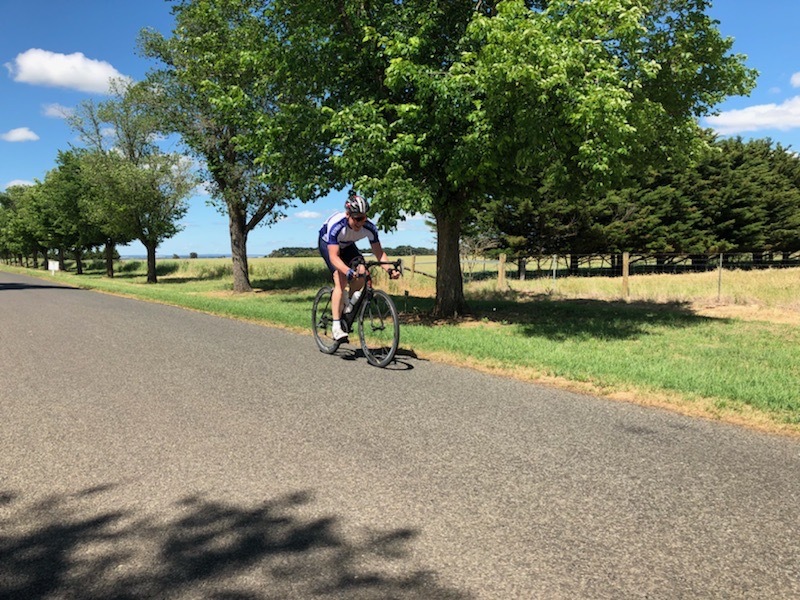 In homage to the club’s home base at Learmonth, a strong breeze blew across the circuit and reminded riders that there is no such thing as an easy race. 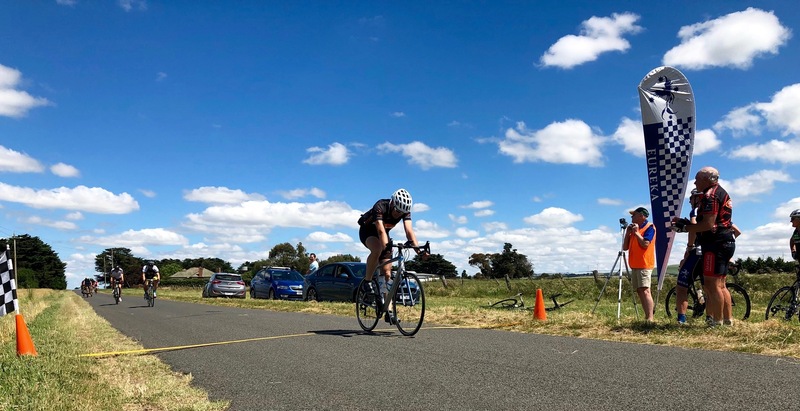 A later than normal start – to accommodate the Ballarat Triathlon Club staging an event in the park – gave riders time to shoot the breeze and relax before the oncoming storm. Just after 10:30 AM they were able to roll out on course and practise before pre race ventolin administering was conducted under the watchful eye of debut Race Referee – Dean Wells. Four riders doesn’t allow for much cover from the wind. In the early stages Dan Whelan and Kevin Lee shared the pacemaking role and maintained a speed that would eventually wear the other two challengers down. Brian Lee was making a rare 2017 appearance on the racetrack – he was just happy to be out rolling his legs over. 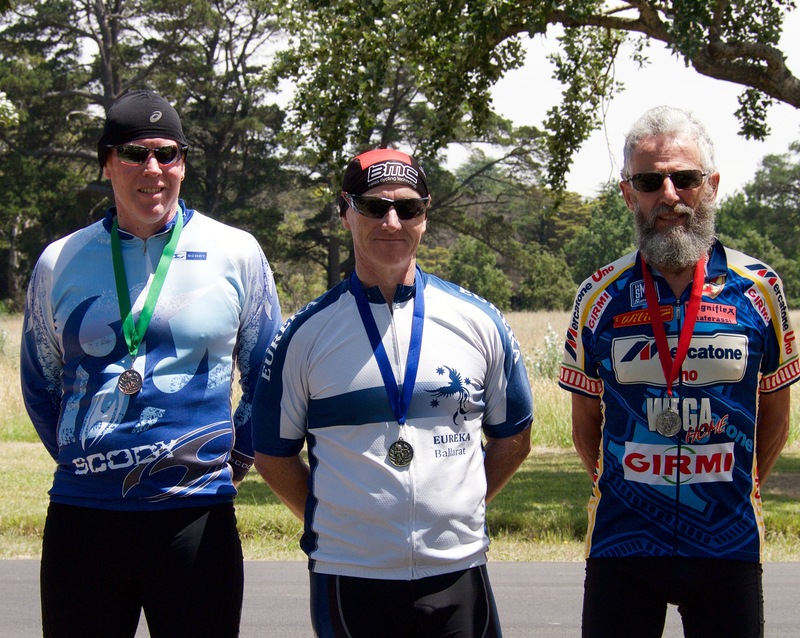 Phil McLennan has made a great start to his cycling career and in his first season he was keen to collect a medal of some description. However, Whelan and Lee’s plan to dominate from the start was simplistic to apply and they soon had their foes stretched. Halfway through tand the race was at their mercy (barring a mechanical incident). They received the two lap call and were not far off catching McLennan, having previously passed Brian. Cat and mouse for the final lap before Whelan ramped the pace up from a long way out. He couldn’t shake the wily Lee though! Swinging into the home straight “Popeye” hooked out and accelerated way from Whelan for a comfortable win. 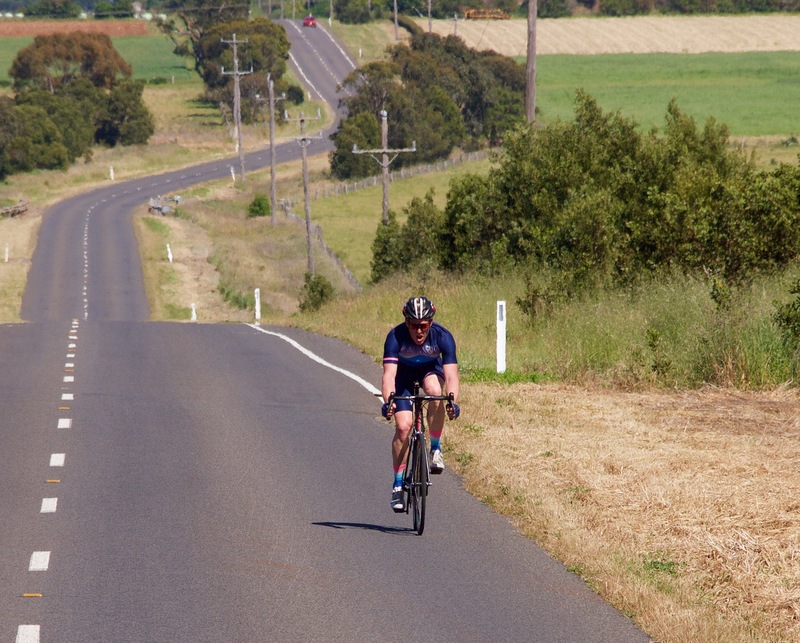 With the no-show of a few pre-race favourites, the Division 2 race quickly became a showdown between the two “trackies”…would James “Mac The Knipe” be able to stop the bullocky sprint of James “Ralph Jones” Gretton? Michael Veal rolled up on his bespoke alloy Kermit The Frog/Miss Piggy fusion. All metallic green and pink, “the Doc’s” bike certainly reminded us of another reason we ride bikes…because they are things of beauty! Roger McMillan was hoping to collect another Division 2 Championship medal and maybe even go one better than his silver from the Road Champs. Peter Livitsanis was planning on sheltering behind all the big guys in the wind and trying to out-sprint them at the end. From early on McMillan was riding away from the other four – unfortunately it was out the rear. 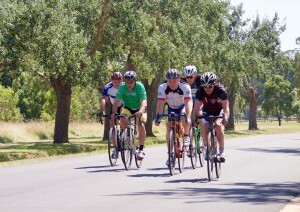 This required much sharing of the headwind between the other four and they all duly took their turns on the front. 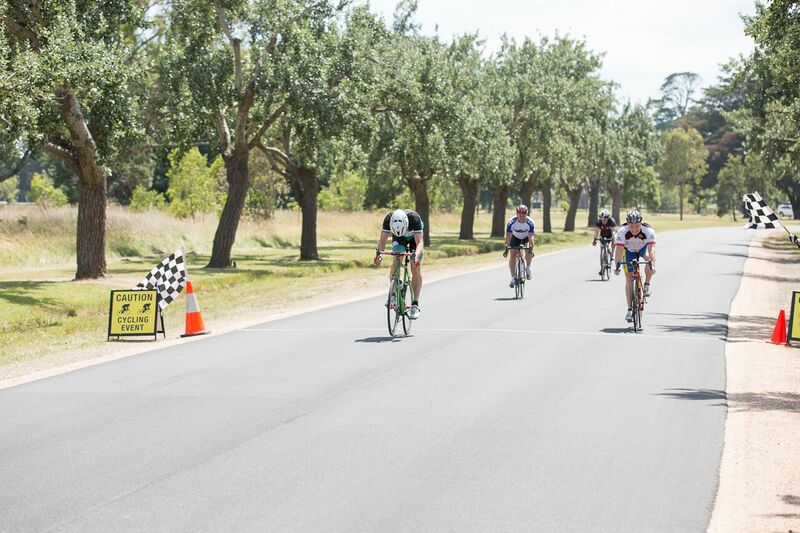 Resigned to the fact that no-one was crazy enough to attempt a breakaway, the race was always destined for a sprint finish and the four had already “turned off” well before receiving the call for two laps. At the bell and they were all keeping a watchful eye just in case someone tried to steal a last minute break. All were poised as they swept into the home straight. Livitsanis lacked the required firepower as Gretton opened a small gap. Knipe loomed on the outside, but Veal came through smashing the gears and taking great chunks out of Gretton’s advantage with each powerful stroke. With contorted faces they raced to the line with Veal clearing out to score a length win. An impressive mix of new and old lined up in the Championship Race. 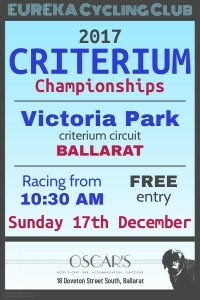 Old as in “old hands” at this racing caper and new as in “first year Eureka members”. 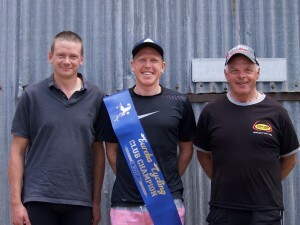 Bob Braszell, Rob Phillips and Matt Bowman were flying the flag for the older generation, Tim Canny, Jason Birch, Craig Lee and Jim Crumpler (arguably the best four sprinters in the club), along with Peter Gunston and Jeremy Vanderklift made up the “new” challengers. The race was always going to be fast and hard on the flat course especially with the Canny/Bowman rivalry. Canny knew his best chance was to line the field out and drop Bowman early, then out-sprint any challengers that may remain. Bowman knew his best chance was to time trial off the front and grind them all into the tarmac. Everyone else knew pain was in their future. And it was so! Early attacks by Canny had the field stretched and struggling. Less than ten minutes into the race and oxygen masks were being handed out. Surges into the wind broke the field apart and Braszell retired to the sidelines. Vanderklift was way out the back, however he could still make out Phillips in the distance. Gunston was in no man’s land with Bowman just ahead. He tacked on for a few laps, but once Bowman recovered his heart rate he accelerated away to try and rejoin the front of the race. Crumpler eased off from the Canny, Lee, Birch juggernaut – when your heart is trying to jump out of your chest and you can hear your own death rattles…it’s time to stop. He linked up with Gunston for a while, but the race was effectively over for them both and like Phillips and Vanderklift they would just enjoy the rest of the day on the smooth surface. Up ahead and Canny kept pushing the envelope. Birch and Lee rolled through for the odd turn, but Canny kept the high pace rolling as he wasn’t convinced Bowman was quite done with. He was right! Bowman rejoined and took a breather at the back whilst the other three continued the assault. No friendly pacemaking here, the race was always in the gutter and everyone was always on their limit. Short attacks soon had Bowman off the back again. 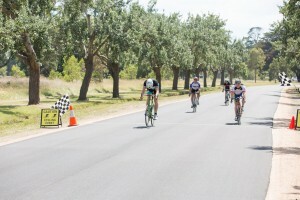 This time the gap blew out to a few hundred metres and with half the race remaining it looked like the three leaders would be the medallists. But! The name is Bowman, Matt Bowman. The man who makes the impossible possible! And once again…he rode back to them. Just before rejoining, Birch announced to his cohorts (with a great deal of exasperation) ‘He’s back on!’. More short attacks ensued and Bowman was again off the back. 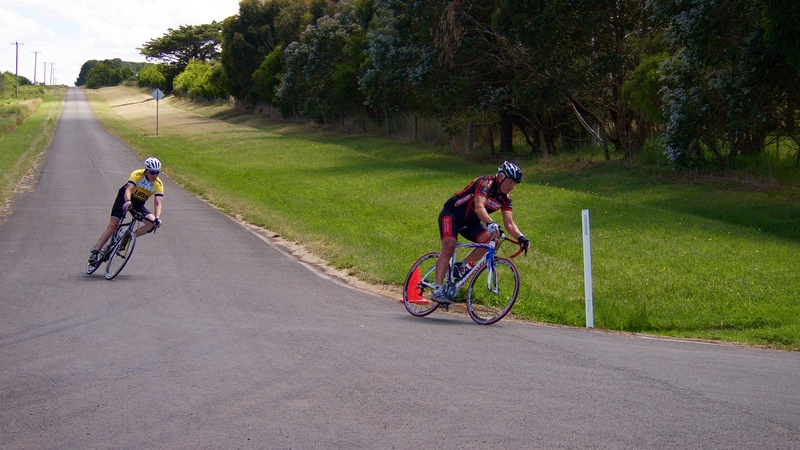 Settling into time trial mode he gradually rode back to the leaders…again! 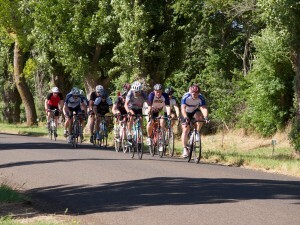 This time, with less than ten minutes to race, the short attacks did not resume. Now was danger time, because Canny, Lee and Birch fully expected the freak to ride off the front and put pay to them. Two laps to go and the four are in tight formation. Bell lap and the formation is still tight. The ball is completely in Bowman’s court. He knows they won’t attack. They know that he will…but when. Out of the trees straight and onto the east road, Bowman is winding up and then accelerating. He goes to the lead and opens a small gap as they enter the straight. Birch can’t respond and Canny looks to be the danger. He comes down the outside and goes to the lead. Lee is coming down the centre and draws level. It’s desperate, it’s close, it’s Lee! Winners and place getters from each race received a Championship medal and a voucher from event sponsor OSCAR’S Hotel & Cafe. 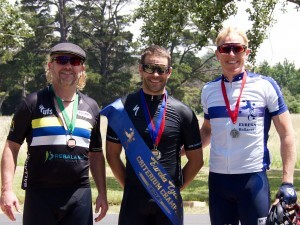 Craig Lee also received the Club Criterium Champion sash. 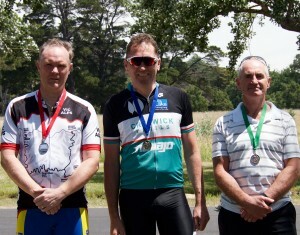 Also presented on the day were the silver and bronze medals from the EUREKA Cycling Club Championship Road Race – to Craig Lee and Jason Birch. Tony Mirabella received a trophy for winning the 2017 Club Aggregate. Tim Canny received a silver medal for finishing second in the aggregate. Peter Livitsanis and Dean Wells received bronze medals for tying in third place. just long enough to trick a few riders into wearing less clothes than the “feels like 5 degrees” temperature actually warranted. 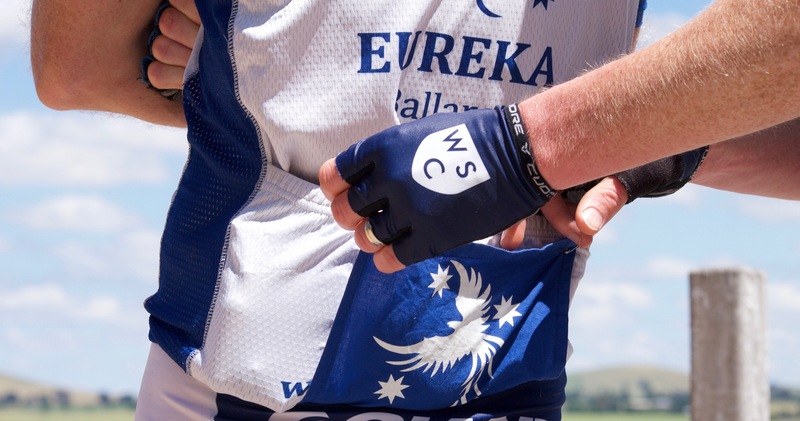 The Commodores Cup has been staged since Eureka Cycling was first founded and although it has been moved around on the calendar, it now takes pride of place at the end of the season. 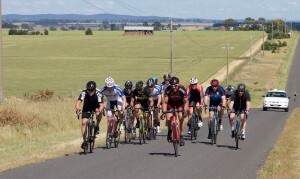 A short, two lap handicap race around Windmill before returning to the club rooms for the 2017 season Presentation Day. 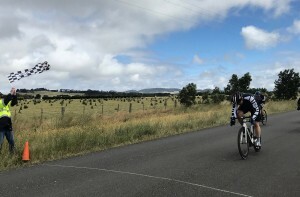 A healthy sized field had entered and once out warming up, the riders soon endured something akin to a typical winter’s day – a strong southerly wind was present – with plenty of cloud and rain showers. Robert Young and Graeme Parker were first away at a meagre 18 minutes. Terry Collie and Phil McLennan set off five minutes later at 13 minutes. Kevin Lee, Peter Livitsanis and Bob Morley were next away at 10 minutes. James Knipe, Roger McMillan and Dan Whelan set off at 8 minutes. Rob Phillips, Mark O’Callaghan, Peter Gunston and Dean Wells were off at 6 minutes. Lindsay Burgoyne, Paul Pickersgill and Stuart Brien launched at 4 minutes. Greg Ley, Matt Ayres and Rick Townsend (visiting from Central Vets) were the chopping block at 2 minutes. Matt Bowman sacrificed himself on Scratch with new Club Champion Tim Canny. In such a short race there is no warm up section. It’s ready, steady, BANG! Straight to your limit! 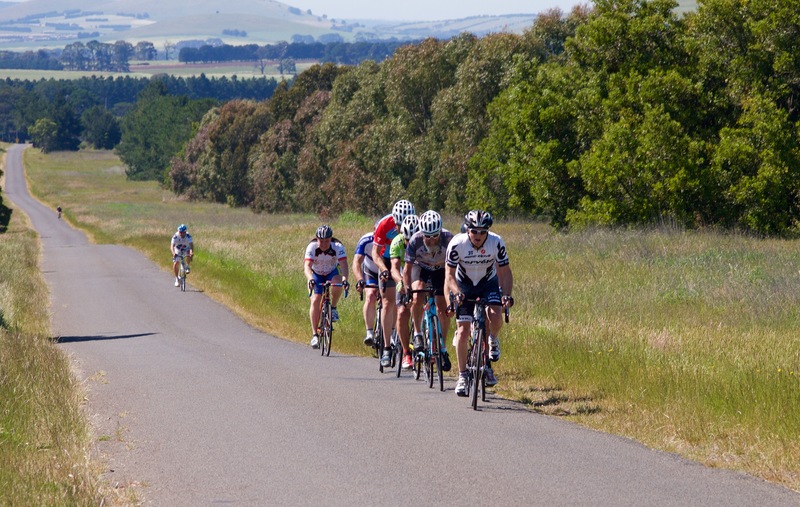 35 kilometres of full speed…because if you’re doing it easy, you are not going fast enough. As such, the field implodes and leaves riders strewn all over the road. 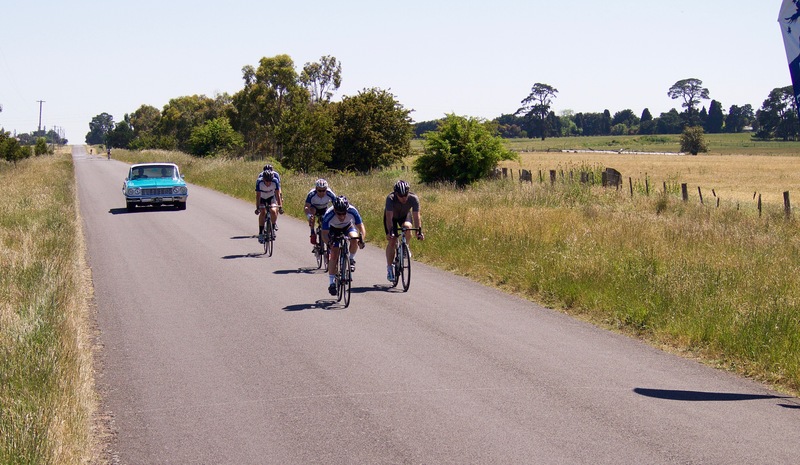 O’Callaghan was an early victim of the pace as the 6 minute group barely took a breath in the first 5 kilometres. Wells succumbed to pressure in his return ride and it was just Phillips and Gunston with 3/4 of the race remaining. McMillan had also lost contact with the 8 minute group. Somewhere up ahead both McLennan and Young were struggling to stay with their cohorts. Somewhere behind Ayres had blown apart and Bowman had been spat out. Virtually a third of the field was out of the race inside the first lap! 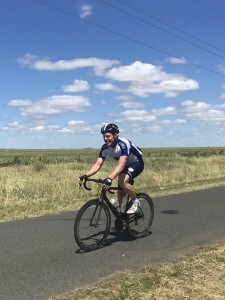 Some were coping well – the 4 minute group of Brien, Burgoyne and Pickersgill were on a flyer and had taken a full minute out of the group ahead after just 8 kilometres. Their fluid turns not only ripped the advantage away from the groups ahead, it kept the chasing bunches at bay. Into lap two a Parker was riding for glory. Collie was the next rider on the road with something resembling a chance. With a numerical advantage, Morley and Co. had opened the gap to Knipe and Whelan and were now closing in on the leaders. 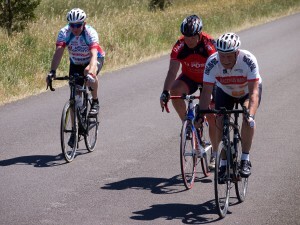 Phillips and Gunston had reeled Knipe and Whelan in – they were the next target for Brien’s crew and they duly collected as they raced past the quarry. Ley and Townsend were swapping turns nicely and Canny was not far behind. The star bunch out on the road was Brien, Burgoyne and Pickersgill. All three were strong and none missed a turn. Phillips had joined in rotations when caught and Gunston put in the odd effort. They picked up Whelan and Knipe. Whelan held on and in typical never say die fashion did a few turns…although it wasn’t expected! 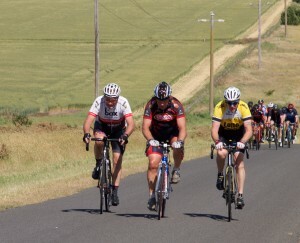 Other riders missed the boat and chugged home under their own steam. Canny had linked with Ley and Townsend however they were too few against so strong a bunch ahead. Turning into Donovans Road and Brien’s ever enlarging crew had caught Morley and Co.
With Brien, Burgoyne, Pickersgill and Phillips doing the lion’s share to try and bridge to the leader – Graeme Parker who stands out like a beacon in his red kit. Desperate to drop any “hangers on” and not be pirated in the sprint, Brien attacked a few times after they had crested the rise, but the others kept being brought back to his wheel by Pickersgill and Phillips. Two kilometres to race and Parker still leads by a few hundred metres. The usual suspects from Brien’s crew are leading the chase and the rider in red is coming back to them at a fast rate. Inside the final 500 metres and Brien has eased off towards the rear of the pack looking for a wheel. Parker will be caught and the excited raiders are jostling for position. Pickersgill comes through with 300 metres to go and he and Brien collide. They steady and resume there windups. Parker is caught and Livitsanis is facing the breeze as Pickersgill swoops by (and almost into the grass). Brien tacks to the right with 100 metres to go and draws alongside Pickersgill who starts to fade. Burgoyne has almost drifted off course to find new air and makes a late dive. 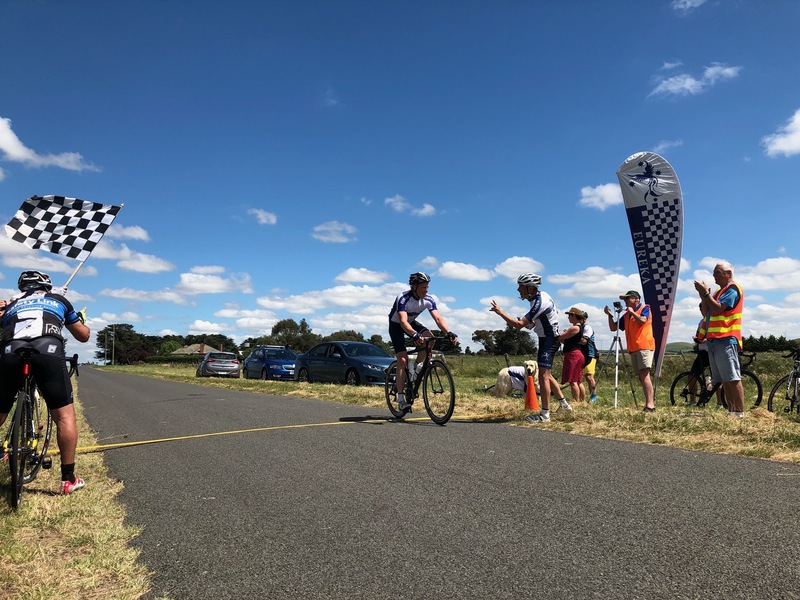 And at the line it is Brien savouring victory from Pickersgill and Burgoyne with Livitsanis and Gunston in the pack picking up the minors. 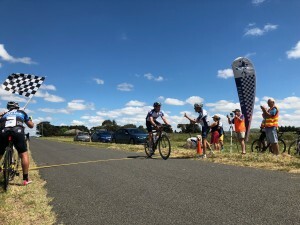 The rest of the field – who hadn’t weighed anchor on the first lap – come in sporadically with Canny claiming another Fastest Time. 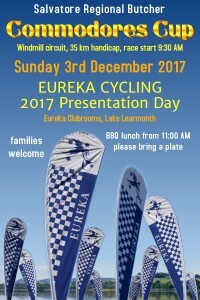 Post race a BBQ feast was enjoyed by all at the 2017 season Presentation Day. 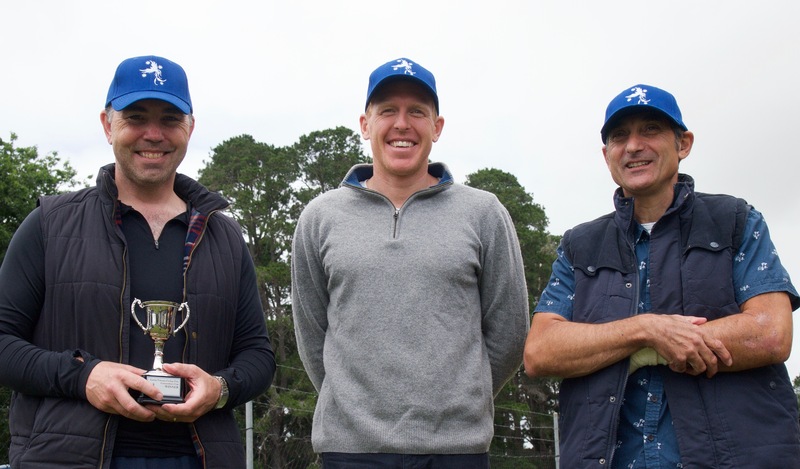 Club President John Faulkner conducted proceedings and after the Commodores Cup presentations moved onto handing out the medals for the recent Club Championship Day. Rob Young (silver) and Graeme Parker (gold) were on hand to receive their medals for the Division 3 Championship. Roger McMillan received his silver medal for the Division 2 Championship. 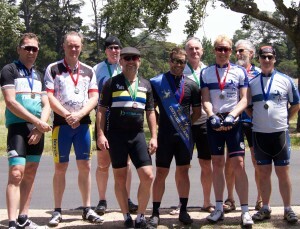 Tim Canny received his gold medal for winning the Championship race and earning the Club Champion title. 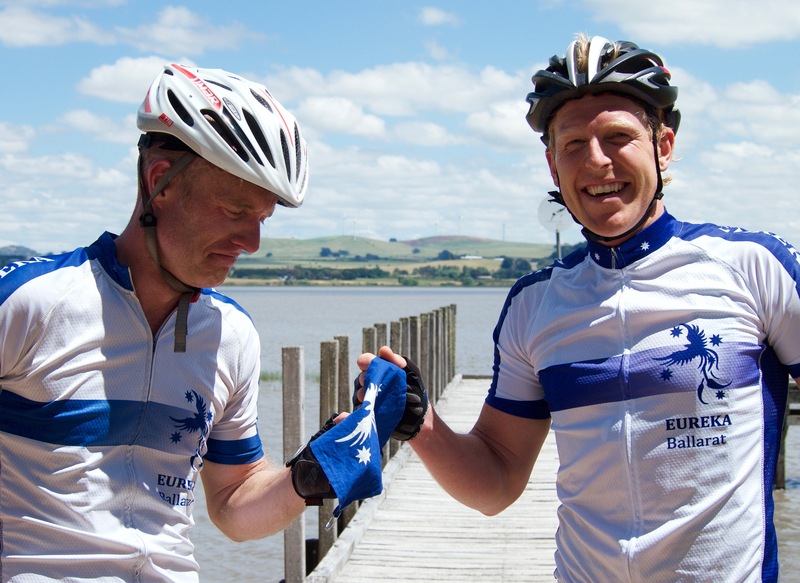 Bob Braszell and Dean Wells were commended for making the “100 ride” board – with 103 and 115 lifetime rides respectively at Eureka Cycling. 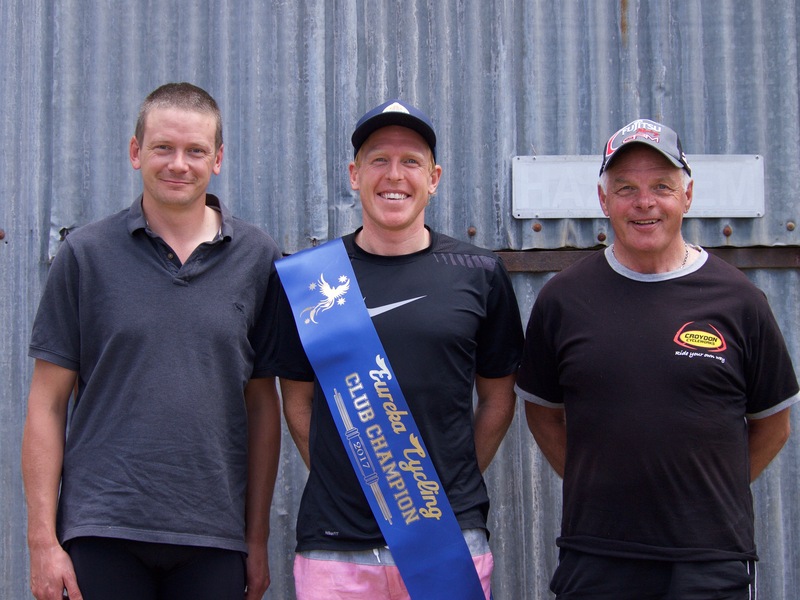 Tony Mirabella was announced as winner of the 2017 Club Aggregate from Tim Canny in second place. Peter Livitsanis earned enough points in the Commodores Cup to tie for third place with Dean Wells. 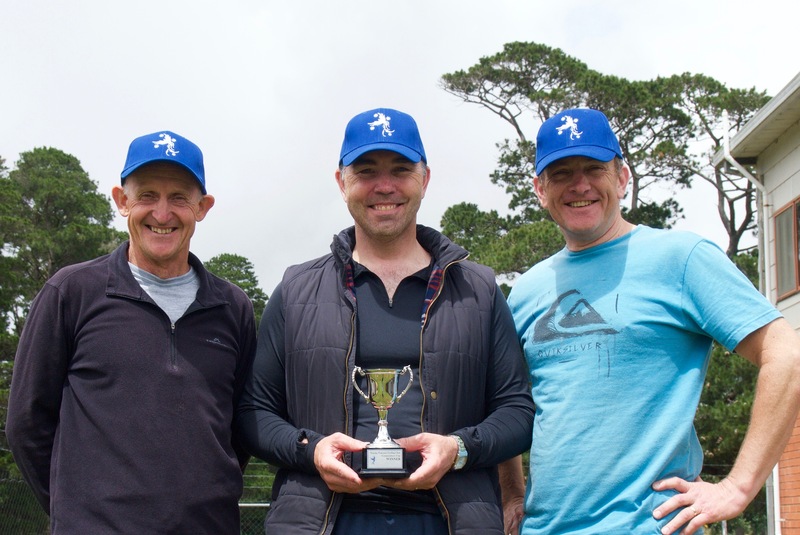 The Steelsmith Trophy – Eureka Club Person – was awarded to Dan Whelan. 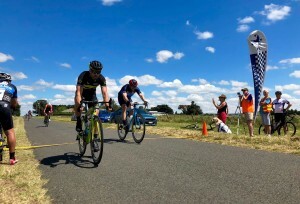 Dan rode the equal most races in 2017 (with Tony Mirabella) at club and VVCC level. He is renowned for his hard riding and has towed many rider around the race circuits. 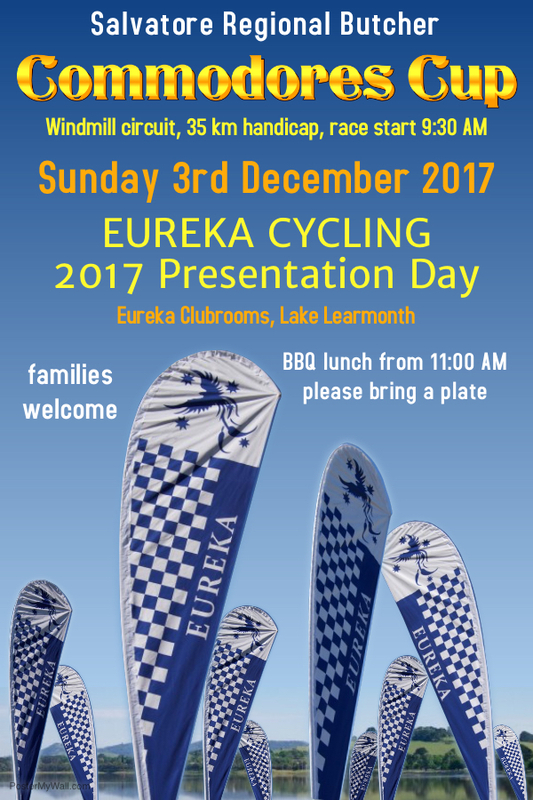 Dan has been a superb representative for Eureka in 2017 and his week in, week out efforts and attendance are acknowledged and applauded with the presentation of the Steelsmith Trophy – which is kindly donated by one of the club’s founding members, Adam Smith. 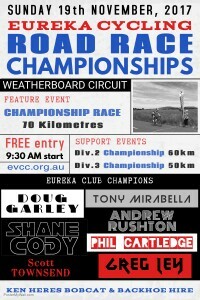 Race morning presented and riders travelled from near and far to contest the Eureka Cycling ROAD RACE Championships. 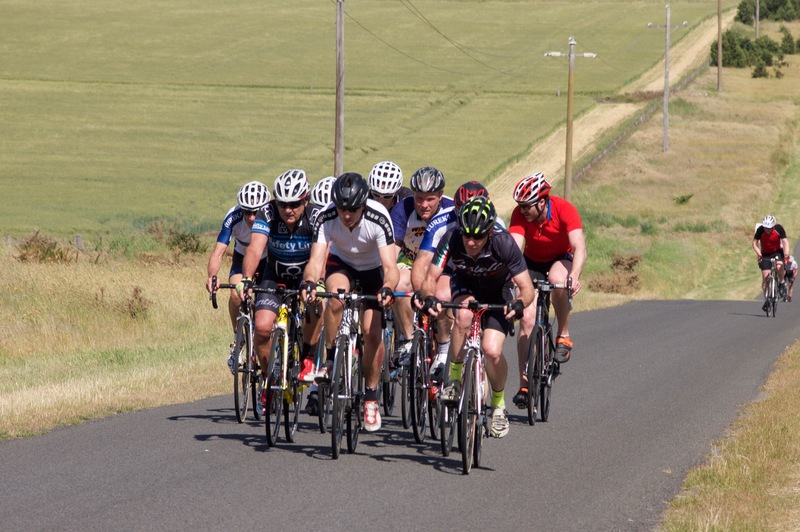 Glorious sunshine bathed Learmonth, yet a fierce north east breeze was present and the racers knew they were in for a hard day at the office, especially as the temperature was predicted to rise into the 20’s. Much conjecture over who would race each division was had during the week…rumours had spread that certain riders would not be present…others issued challenges to their nemesis….alliances were formed…social media fuelled speculation and various scenarios were discussed. At the sign in desk the numbers grew for the Championship race and the Division 2 race, yet entries were light for the Division 3 race. 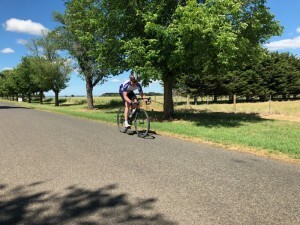 Consisting of just three riders – John Faulkner, Graeme Parker and Rob Young – the Division 3 championship race was over 50 kilometres and the wind would have much to say about who would survive. A silent gentleman’s agreement was had and the trio set off to engage the circuit. Work together, defeat the circuit, sprint for the prize, may the best man win. 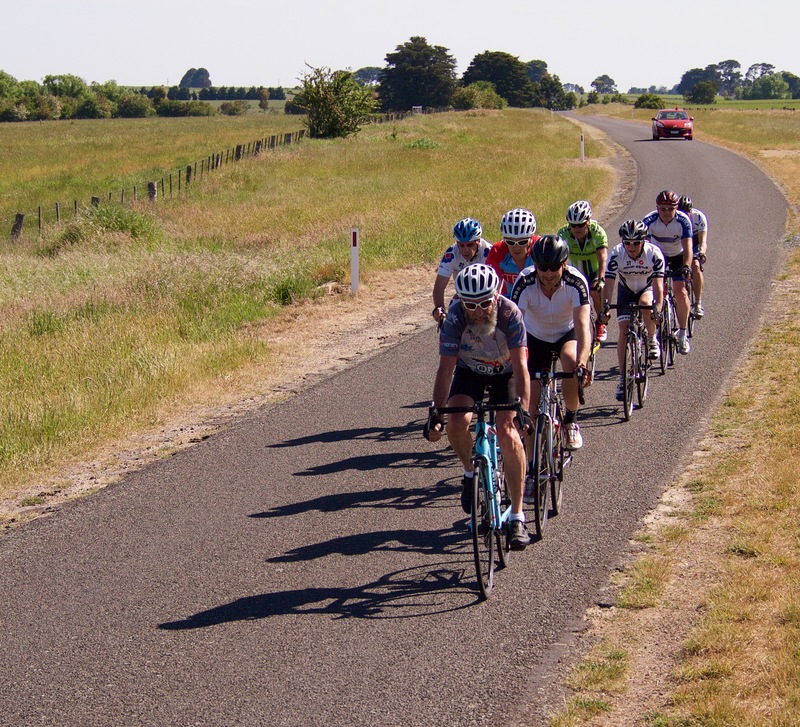 Faulkner lasted for 35 kilometres before the elastic broke, leaving just Parker and Young out on the road. Swapping turns, yet being wary not to over exert, the cat and mouse began. 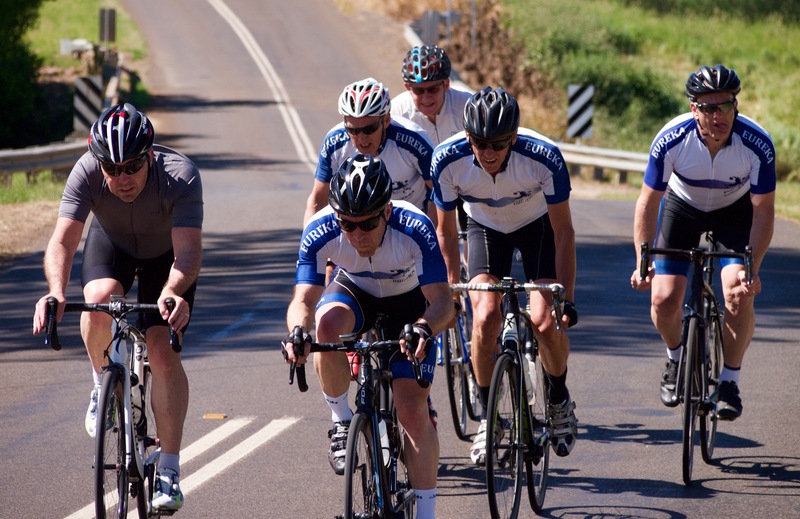 Whilst Faulkner pulled up at 40 km and put the cue in the rack – so to speak – Parker and Young started the mind games. 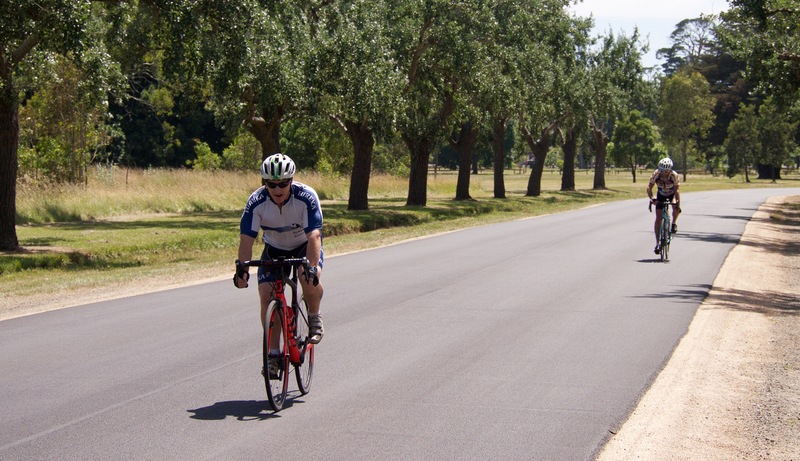 Parker surged down Weatherboard road towards the chicane and attempted to unsettle Young, yet the challenge was matched. A sprint would decide the medals and each was wary not to give anything away. Through the final turn and just 1500 metres to decide the champion. Onto the hill and they raced side by side, over the crest and Parker edged just a little ahead then unleashed his sprint. A blink of an eye and the contest is over, Parker raced away to the win and Young crossed a few seconds later, gallant as ever. At the start line thirteen amassed – Jim Burzacott, Terry Collie, James Gretton, Jason Hendry, Jeremy Humber, Jude Jonasson, James Knipe, Kevin Lee, Phil McLennan, Roger McMillan, Bob Morley, Brian Ure and Dan Whelan – then set off in search of victory. 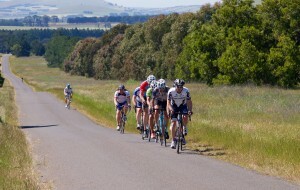 The wind decided much of the day’s play as riders jockeyed for wheels and hiding in the pack was a much desired tactic. Early in the race the likes of Whelan, Humber, Knipe and Burzacott made much of the running. Not many attacks would ensue, for the plan was to reduce the numbers by attrition. 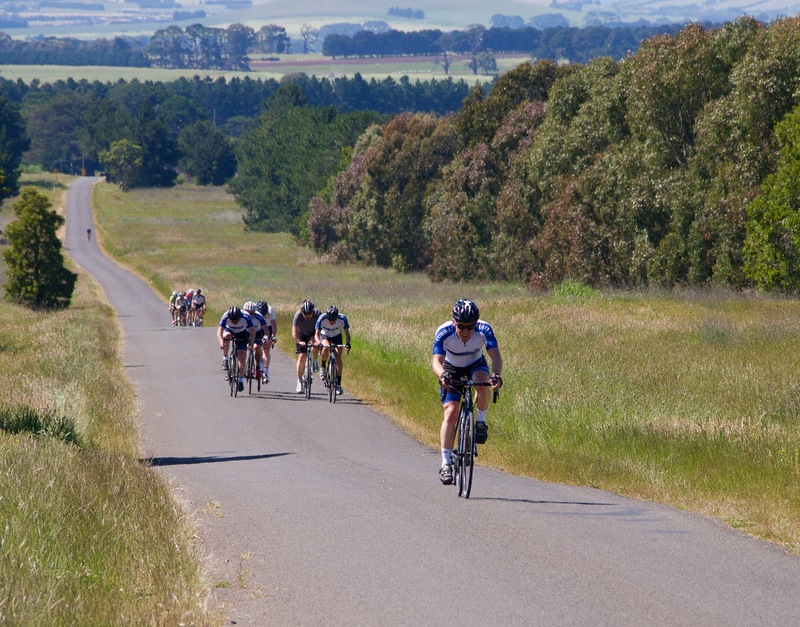 Stay in the gutter and keep the pace strong… McLennan was an early casualty and others were seen to yoyo off the back as the halfway mark approached. Rarely on the front at this early stage, yet always within striking distance were the experienced Collie, Morley and Gretton. Others remained hidden, yet ready to chase as required. The race wore on, yet the dozen remained intact and bar for sporadic quickenings through the chicane the race was nullified to the point that a sprint finish seemed inevitable. McMillan had placed himself comfortably in the rear half of the field and noted how easy Ure was coping with the race. This was a man to follow! 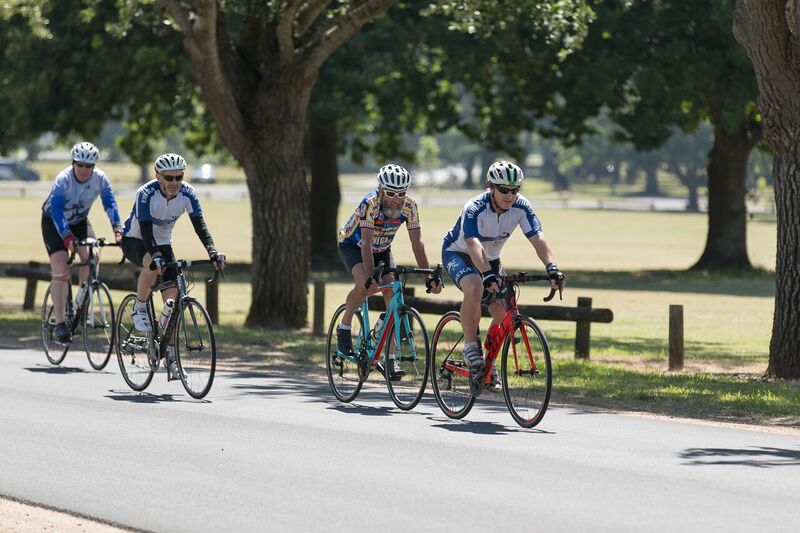 The bell lap and by now the stronger riders were worried that to attack would leave them exposed to those whom had stayed relatively hidden throughout proceedings. Ure casually rode off the front over Weatherboard and opened a small gap down towards the chicane. Gretton (who is at one with gravity) followed and crossed the space to Ure who was now in full fledged attack mode. They quickly opened the lead to over 200 metres. Ure powered through the final turn with Gretton tucked in behind. 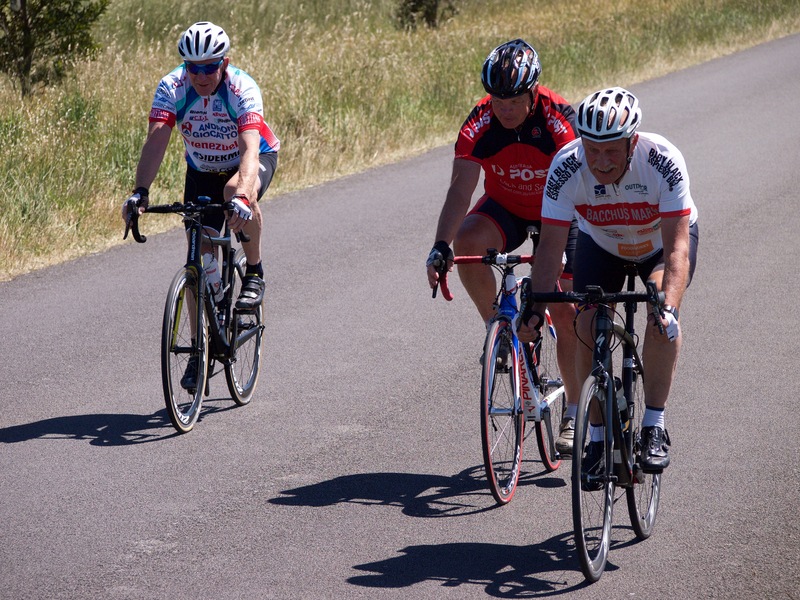 A quick glimpse over his shoulder gave him the confidence to launch early on the climb. Be damned if there s a hill in the way! 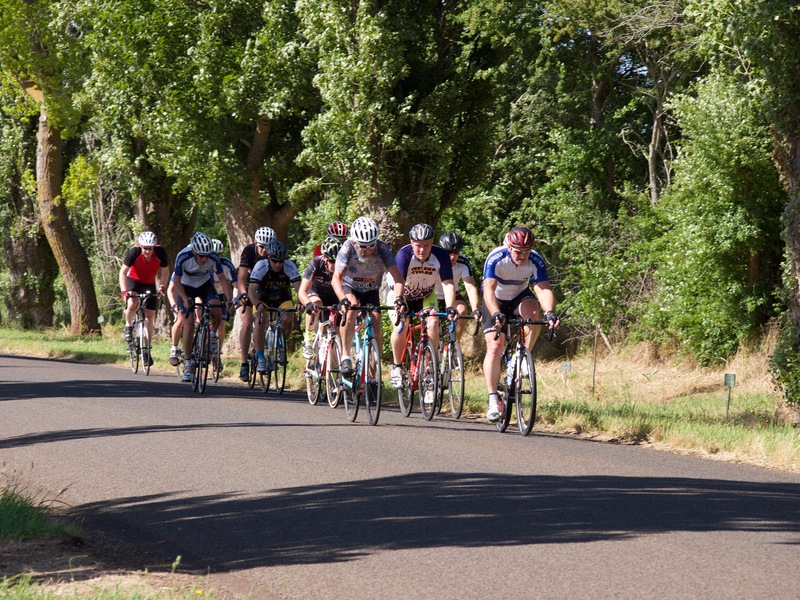 The pack rounded the turn and riders jumped from wheel to wheel as they watched Ure and Gretton commence the climb – then in a moment Gretton has lost contact and Ure races away. Could they close to Gretton? Ure crested the Hendersons Road hill and has a clear margin. 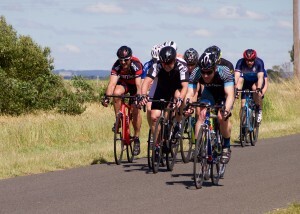 The pack charge past Gretton on the climb and crest the hill. Lungs and legs are bursting yet medals can be won and Ure is just ahead and racing to the line to claim victory. McMillan has exploded out of the pack and races to second a few lengths ahead of Humber. Morley appears to have fourth place sewn up until Collie ducks around and grabs it on the line. 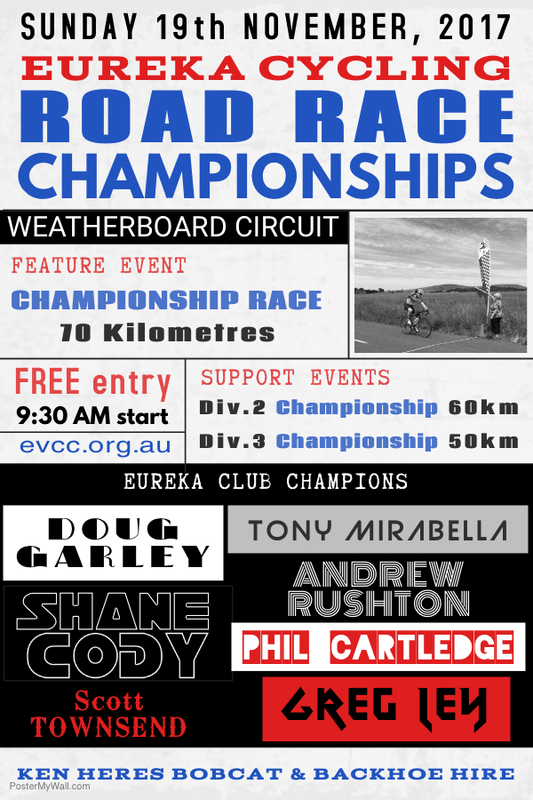 The feature event of the day was the Championship Race to decide whom would be crowned 2017 Club Champion and earn the right to wear the blue dossard emblazoned with the white phoenix during season 2018. 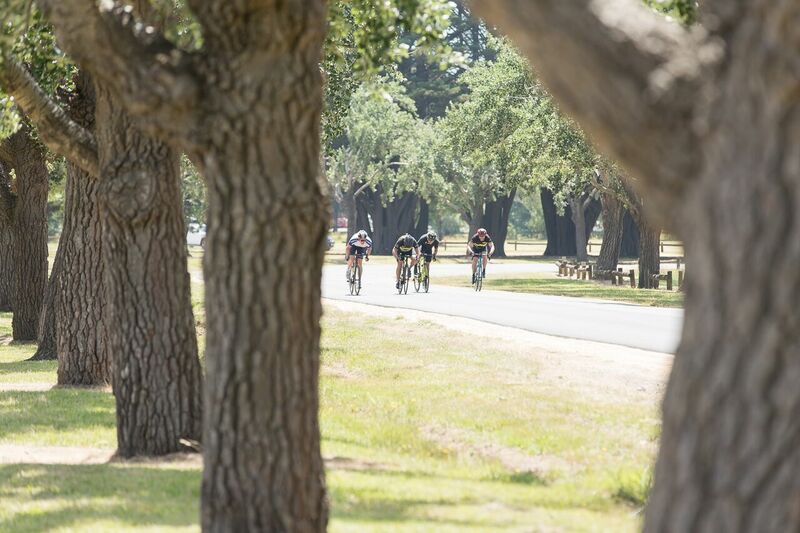 Sixteen of Eureka’s fastest riders signed on to ride in one of the largest fields yet assembled for the Championship race, almost half of them had ridden the Misery 100 the day before…would that be a factor? The early laps were fast and Braszell and Phillips soon found themselves a tad off the pace. Pickersgill, Calvert, Peter Canny and Gunston were also stretched and soon enough the field had been reduced to ten. 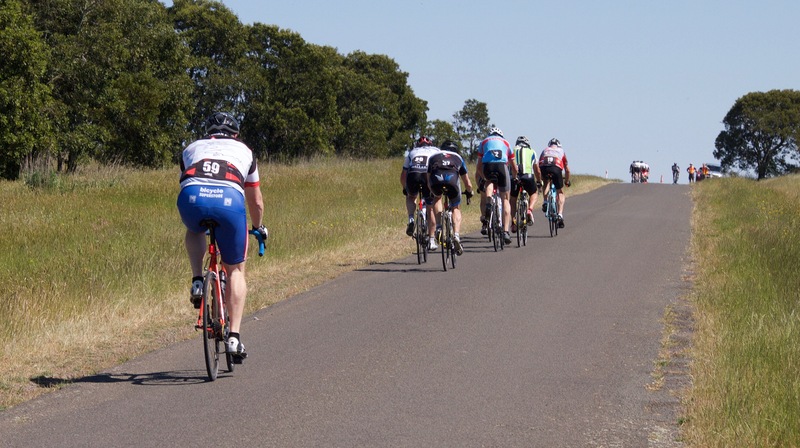 The dropped riders fought on in their ones and twos…sometimes closing the gap to the riders ahead, then watching the gap drift further apart and never rejoining. The race for the ten remaining riders wore on. No major attacks, yet plenty of pace and stretching of the elastic bands. Seemingly from nowhere Tim Canny made an attack heading up Avenue Road with just under 30 kilometres remaining. 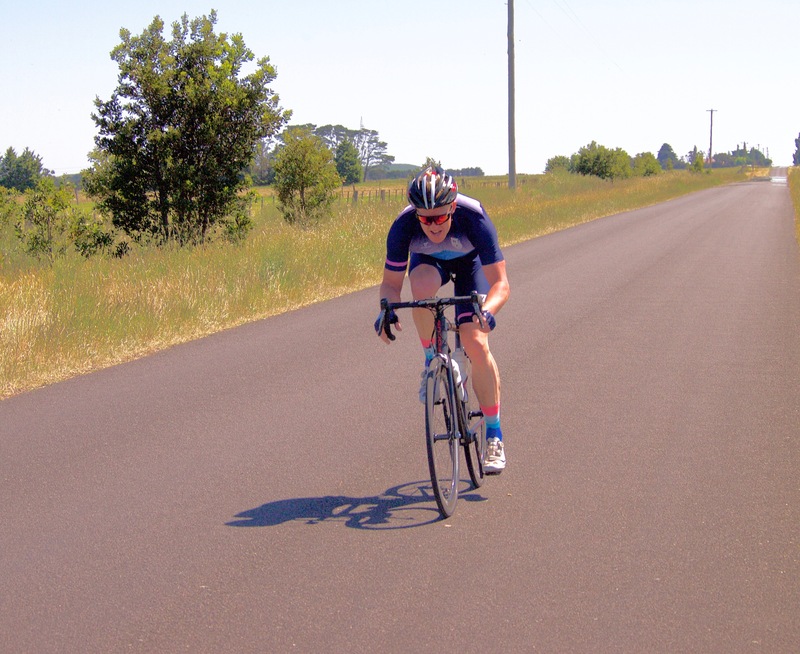 Timed to perfection – at the top of a rise and just as the road turns due north – Canny’s effort utilised the marginal cross headwind to maximise his effort and open a space. The others looked left and right with no-one willing to commit to lead the chase. Out of the Avenue and Canny had not increased his margin, yet the bunch were not working to chase him down. No one wanted to over exert with so far left to race. Canny meanwhile was watching his watts as he crested Weatherboard. 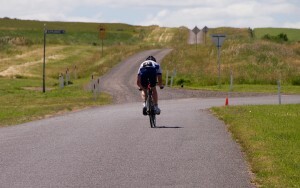 He needed to conserve his effort with the tail wind without conceding too much ground. Through the chicane and his lead is around 400 metres. Birch leads the chase and with dare has shaved a few lengths off the gap as the bunch fly through. He looks over his shoulder and realises he is in no mans land, the bunch has sat up…is the chase over already? With barely a hint of organisation the “chase” bunch has been reduced to nine individuals intending to just survive. 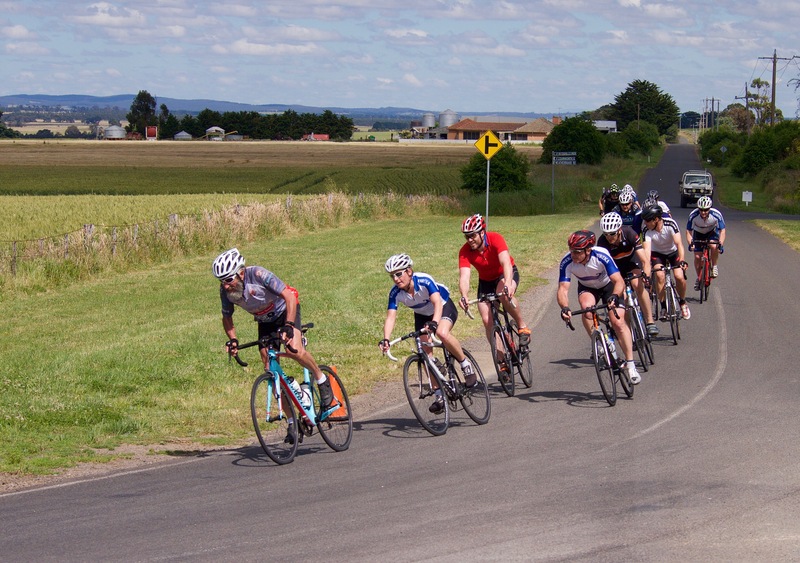 Over the Hendersons Road climb and they pass through the finish line with two laps remaining. Canny is already heading up the Avenue, though with some teamwork they could possibly bring him back. 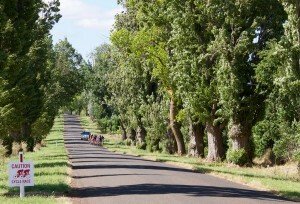 Survival trumps teamwork…they head up the Avenue and watch the distant Canny blend into the sea of greenery. Canny is racing away to possibly his first win in the Club Championship. He watches the power meter and he remembers to drink. The gap has been made, now to press the issue! The bunch is no longer chasing. They have consigned themselves to racing for the minor placings and a race within the race has developed. One by one, individuals surge or make a short attack, all with the aim of wearing opponents down and it works as Bowman finds himself off the back. Brien uses his skills to open a gap through the chicane. The bunch respond and bring him back by the climb in Hendersons Road. 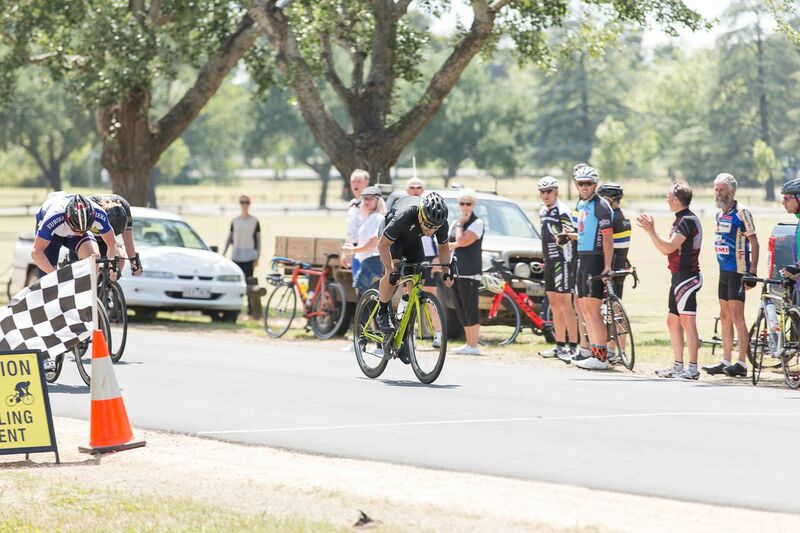 They crest the rise, receive the bell lap and have just ten kilometres to stake a claim on a medal. Mirabella is quite active over the next five kilometres – surging, easing, then surging again. He has riders on their absolute limits, but they keep clawing back. Canny sweeps through the final bend when the bunch sweep through the chicane. He takes the final ascent with ease and cruises to the finish where he is greeted by much applause – all hail the new Club Champion. 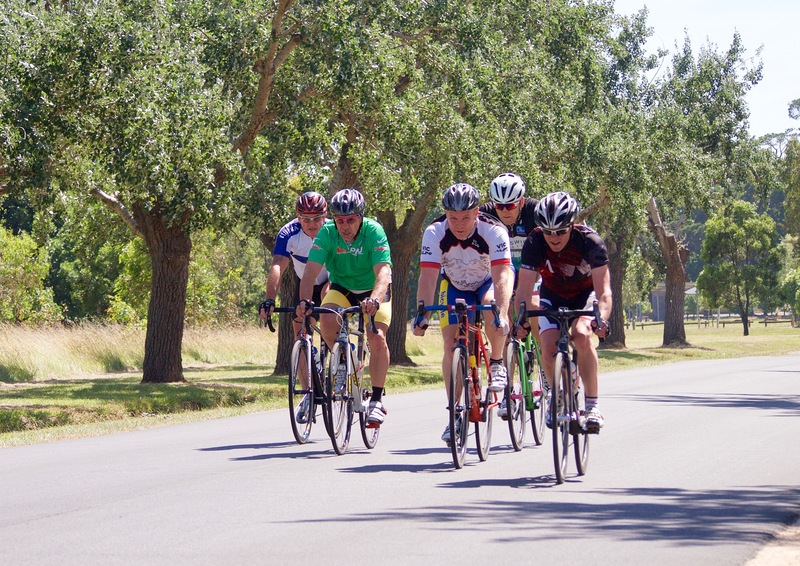 The bunch take the final turn. No-one wants to play their cards too early. The sprinters are happy to be towed up the hill, but the slow twitch riders need to stretch it out into a grind. Ley goes first early on the hill. Lee is on his wheel in a flash and Birch is next. Mirabella draws alongside Birch as they all overtake Ley. Over the hill and Lee kicks, Birch can’t respond immediately but they have gapped everyone else. Lee holds his gap to the line and claims second ahead of Birch. Ayres rallies late to come through in fourth with Brien close behind in fifth. 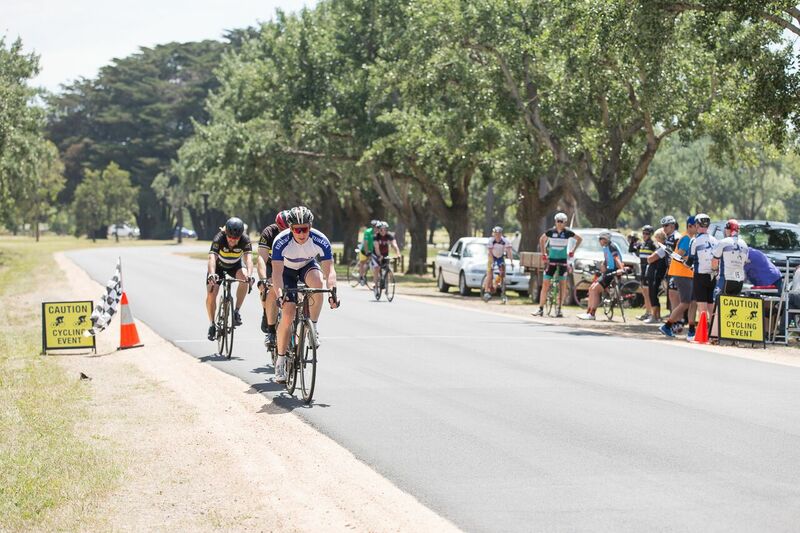 Thank you to all who made the day a success – referees, marshals, kitchen, spectators and of course the riders. 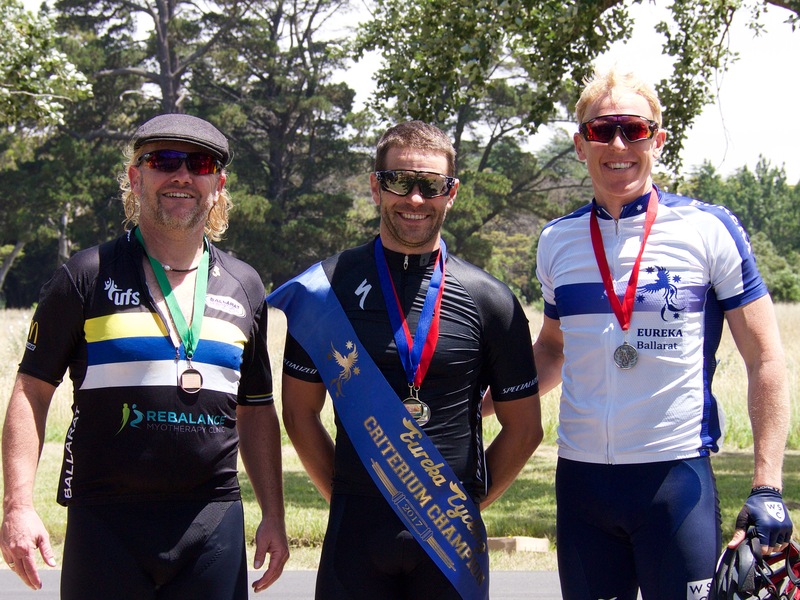 Tim Canny unpinning the Phoenix dossard from Greg Ley’s (Club Champion 2016) jersey. Greg and Tim hamming up the handover of the dossard. 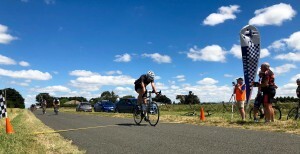 Glorious sunshine and a light breeze made for brilliant racing conditions at Learmonth. 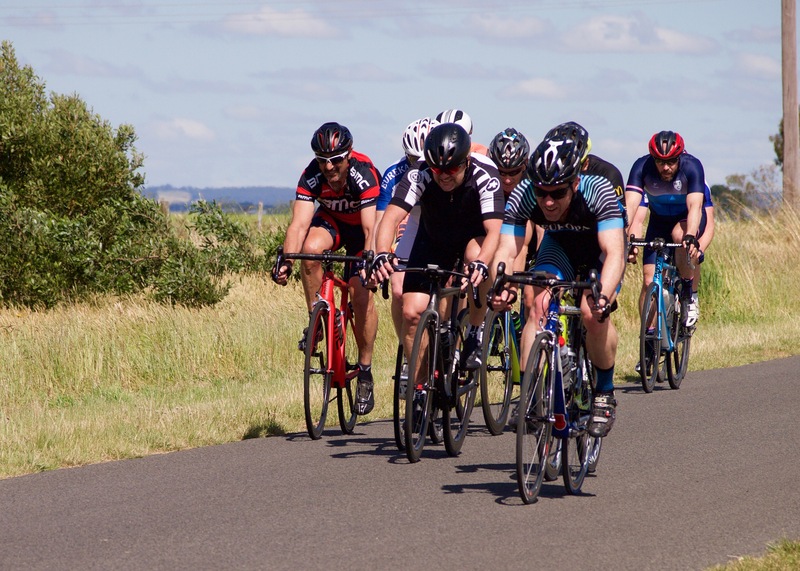 Graded racing gave riders an opportunity to put the finishing touches on their preparation for the Club Road Race Championships which were being staged the following weekend. 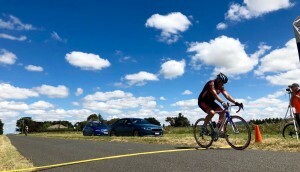 Michael Lynch dusted off his steed, donned the lycra and made his long awaited return to racing. Well it was more like a training ride as Michael “raced” solo around the Windmill circuit for a few laps. 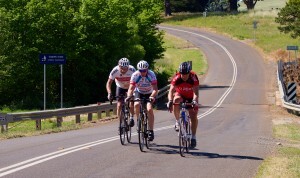 John Faulkner, Graeme Parker and Robert Young comprised Division 3 today and a hearty hit out was had by all. A team time trial was the order of the day and for the most part they stayed close together. The long climb up the lower slopes of Mount Beckworth stretched the field out with Parker scooting away, Faulkner trailing off the back and Young between them in no man’s land. 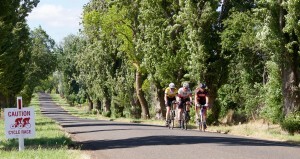 They regrouped on the long downhill section after the turnaround and resumed their team time trial back to Learmonth. The finish was highly exciting affair as the three fanned out and raced head to head down to the flag. Faulkner edged ahead in the final metres and held on for a courageous win. The largest field of the day provided some interesting discussion points as the eclectic bunch used the race to size each other up ahead of the Championships next weekend. 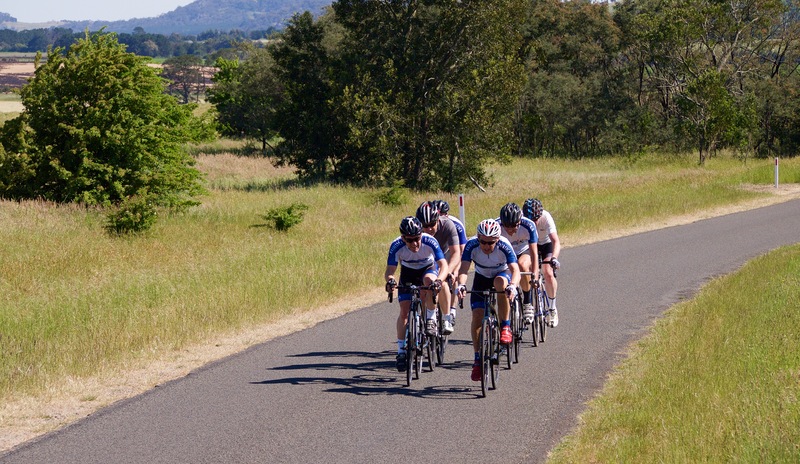 Bob Braszell, James Gretton, Jeremy Humber, James Knipe, Peter Livitsanis, Roger McMillan, Bob Morley, Brian Ure and Dan Whelan provided some hints as to what we can expect to see next Sunday. 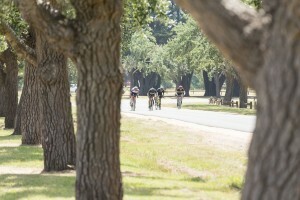 Early in the race the group settled into a steady rhythm and rotated turns evenly. Then the word went out that it was a Scratch race and not a handicap. Soon after the shenanigans commenced and Ure was at the forefront. He opened a gap through Coghills Creek which had riders scrambling for wheels. Morley was keen to regain control and with Knipe they quickly reigned in the loose cannon. Unfortunately the surging caused McMillan to start yo-yoing off the back and he was jettisoned not long after. 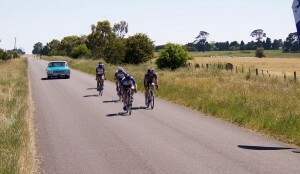 Livitsanis, Humber and Whelan rolled onto the front of the bunch as the road turned upwards. Morley kept a good position tucked in behind. Gretton was starting to feel the heat of the day and Braszell seemed to be coping easily and without expending too much energy. 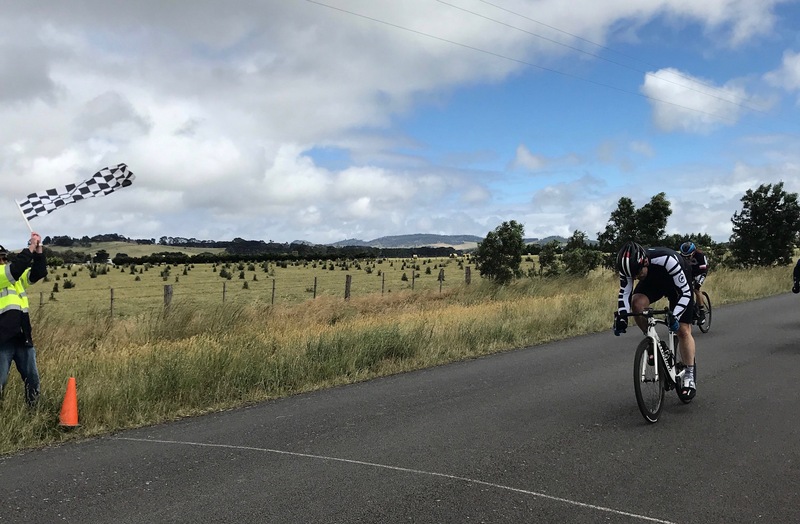 McMillan appeared on the back of the bunch after hitching a ride with Division 1, however he was off the back again passing the Glendaurel CFA shed. 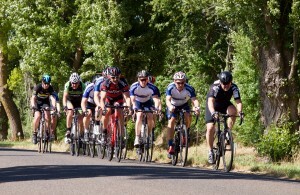 Gretton was starting to lose contact as the bunch neared the top of the climb. The turnaround point was closer to the crest of the hill today and Gretton was able to rejoin on the descent. 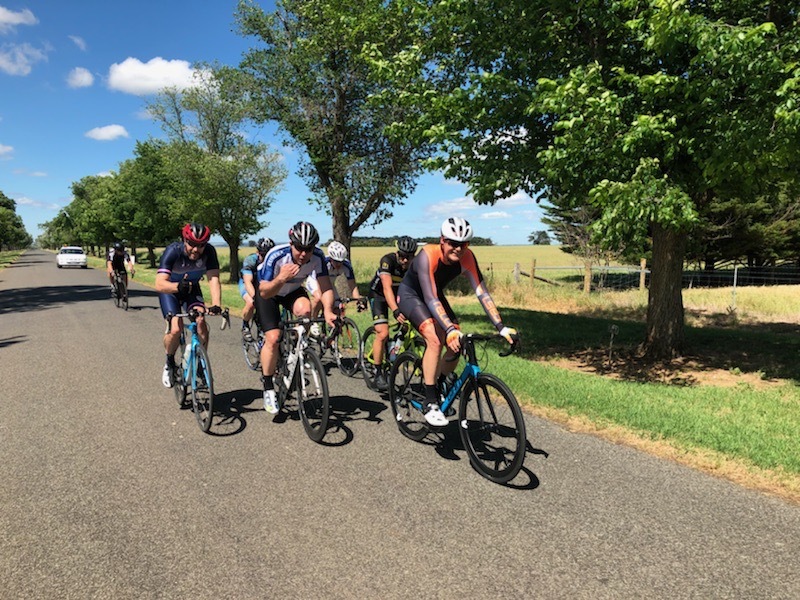 Back through Coghills Creek and Livitsanis, Whelan and Humber were still present at the front of the pack trying to stretch everyone out in a true staying test – rather than make it a sit and sprint. 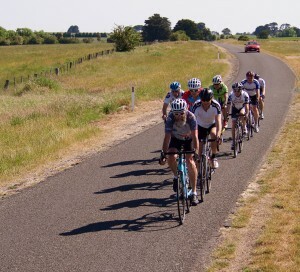 Into Donovans Road and eight riders were still present. No one could get away up the rise and after all that effort the race would be decided by a sprint after all. Knipe opened up his sprint from a long way out with Livitsanis close behind. Are sprinted through the pack and Humber responded. They swept to the lead and opened a small margin. Morley and Braszell emerged out of the pack, however they were racing for third as Ure and Humber match raced to the flag. Ure taking the hard fought victory. Morley and Braszell unable to be split by the naked eye. 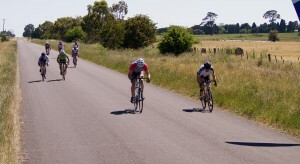 Gasps aplenty as the Division 1 riders realised they were going up against Tim Canny. Some discussion as to how this race could be anything than a “benefit for Tim” and the protagonists had soon talked him into giving them a head start! 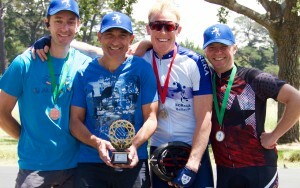 Canny was keen to oblige as he is after hard racing in preparation for the upcoming Tour Of Bright. And so, what was listed as a Scratch race had just become a virtual handicap race. One versus Six. Time gap 4 minutes. Distance 54 kilometres. Seems fair! Steve Biram, Stuart Brien, Rick Calvert, Peter Canny, Paul Pickersgill and Brendan Schiemer set off and quickly got into prefect rotations. After what seemed an eternity, the younger Canny set off in pursuit. 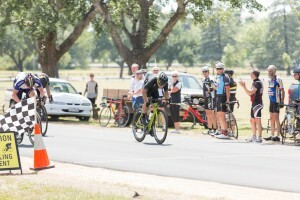 At the end of the lap of Windmill he had taken over 90 seconds out of the gap. Up ahead and the two big powerhouses Pickersgill and Brien started taking longer turns and stretching the limits of the group. Biram was hanging on for dear life and Canny, Calvert and Schiemer were rotating through in between gasps for air. 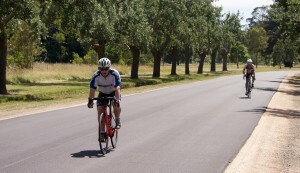 The younger Canny kept his power output around 330 watts and gradually ate away at the time gap, however with road curving road and the dips and crests he could never see his prey up ahead. That prey was led up the hill by Schiemer as the lightweight rider showed his liking for all things upwards. Calvert and Canny both enjoyed the slight easing in pace and were able to match it with Brien and Pickersgill. Somehow, Biram was still hanging on. Back through Coghills Creek and there is still a big chance that the Six can hold off the One. Calvert is struggling and Biram is coaching him through the pain. Behind them young Canny is coming, but is he coming fast enough? 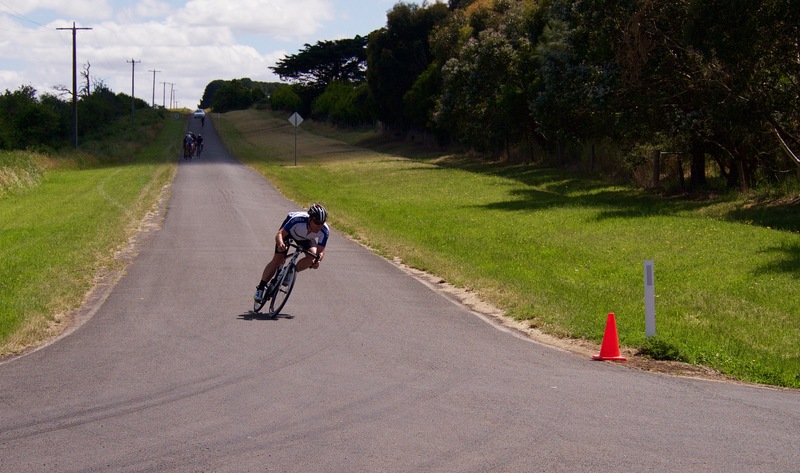 Onto the Windmill circuit and there is still a gap. It’s unlikely that Tim can catch them, yet the bunch still swap turns. Over the crest and the games commence. No one wants to be on the front so Biram comes through and urges the others to follow. Biram pushed for 600 metres, it’s the least he can do after being towed around the circuit. Nearing the sprint point and the others are raring to go. 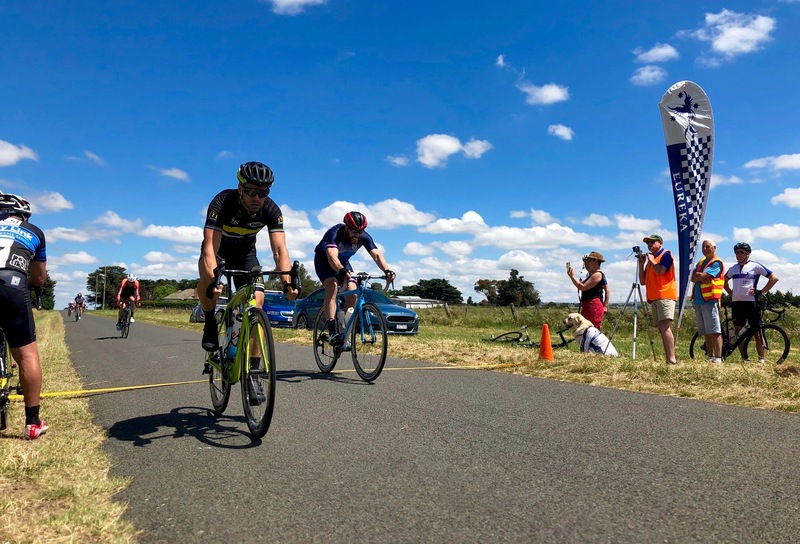 Brien goes first and Schiemer follows quickly grabbing the lead and holding it to the line for the first “disc brake” victory at Eureka. Five cross the line in a blur, Biram is only 15 seconds behind and Tim crosses fifteen seconds after that.